Talk about new year and there we have many talking about resolutions, trust me I really don't know make any resolutions simply because I end up forgetting them. Does this sound familiar? :P... well if you are not like me, good for you and good luck on the resolutions. 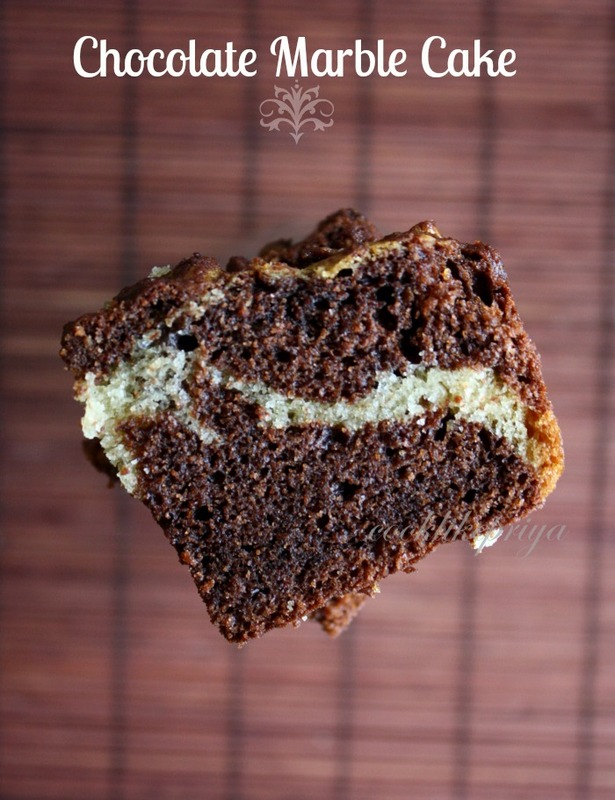 Since its a good start to the year I wanted to share this simple and easy marble cake that is totally eggless and butterless. Did I say simple? yes no need for a beater just with basic ingredients and it works like a charm. Make sure to make a big portion as it can get over quickly. 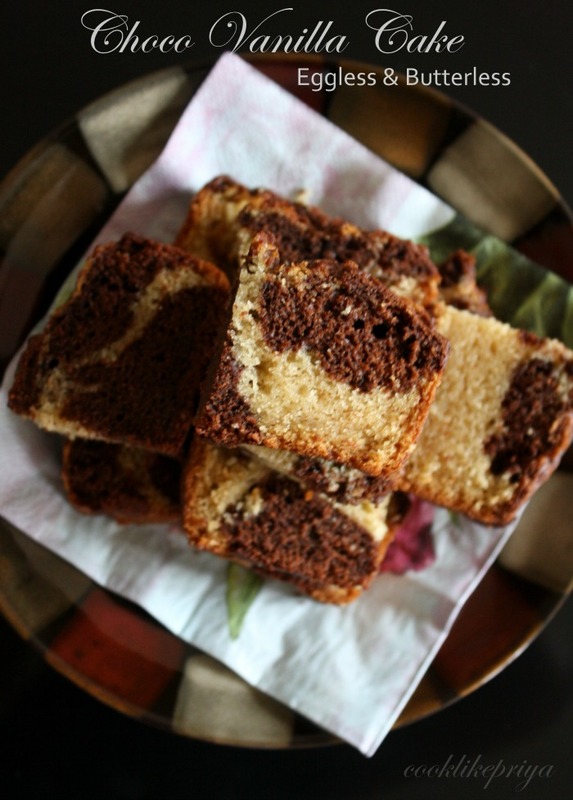 This is a light marble cake that is great as a snack or call it a snack cake. Its moist and tastes great the next day or when completely cooled down. Don't be like me and hurry to eat the cake. We had friends over for lunch and I had served this with their evening tea and they loved it so much. In another large bowl beat the yoghurt with a spoon to remove any lumps and add the sugar to it, beat again and wait for the sugar to dissolve well, this would take 5 mins. Now add the baking powder and baking soda to it. Beat again and set aside for 5 mins until you see small bubbles on the surface of the mixture. Its time to add the vanilla extract and oil. Mix well until the ingredients are combined. Now add the flour in 3 batches, gently fold the mixture using a whisk or rubber spatula (or even a wooden spoon) until you see no more bubbles/streaks of flour. Happy new year wishes Sis, how wonderful to know that you dont take any resolutions, i do share the same thought.I dont take any resolutions too. 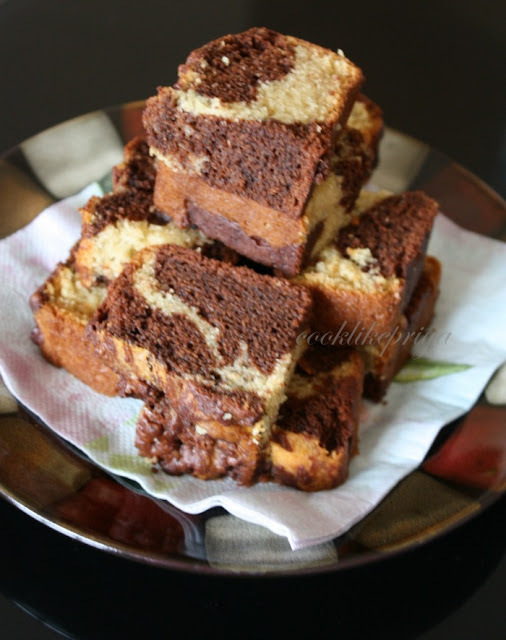 Marble cake looks super light,fabulous and definitely super attractive. yummy and tempting sis.want to grab all pieces.me too not taking resolution. Wow...really an awsome thought...A cake without egg or butter...unimaginable..great job.. Happy New Year Priya..Cake looks very moist and scrumptious..
May I have few pieces now Priya? Can't resist myself, so tempting choco marble cake dear. Wow, this cake looks very delicious! Wonderful!! Happy New Year priya. 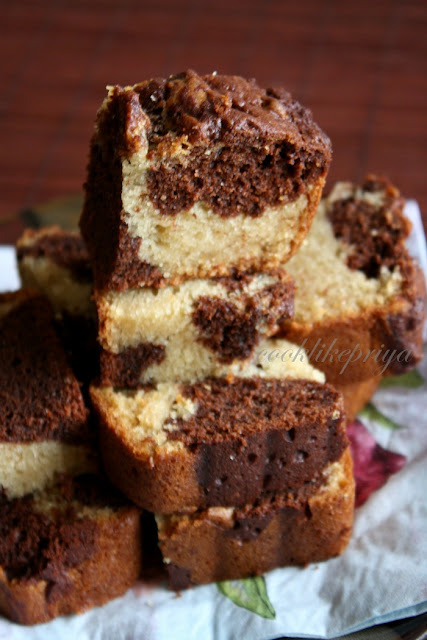 Too good, Marble cake looks delicious. Wish u happy new year priya...BTW this luks really yummy...cool cake vth nice cliks. Lovely and light cake. Luvd the 2nd click so much. Happy New Year and this is one yummy cake. looks yummy n delicious....awesome clicks.. They are so good Priya. Love the marble effect,perfectly baked and yum combo too. Happy New Year Priya, the cake looks absolutely delectable, bookmarking it. Do u have a pinterest icon for me to save this recipe ? Hi I am new at baking and tried your marble cake yesterday! Everything was good the taste , the marble effect but my cake was not moist and fluffy!! Can u pls suggest me some tips for a fluffy and moist cake! P.s. I followed the recipe as it is but baked it on convection mode!